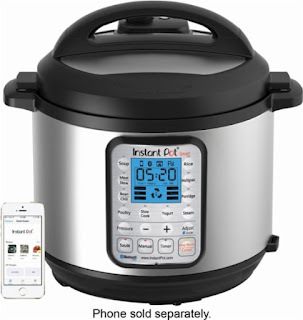 Right now at Best Buy you can get this Instant Pot - 6-Quart Bluetooth Enabled Pressure Cooker - brushed stainless steel for $99.99 (Retail $159.99). Cook your favorite dishes with this Bluetooth-enabled Instant Pot multifunctional pressure cooker. Fourteen smart programs let you cook everything from chili to yogurt, and the microprocessor monitors pressure, temperature and intensity to produce perfect results. Replace your rice cooker, yogurt maker and slow cooker with this Instant Pot multifunctional pressure cooker.